A reliable, professional, entertainment solution for high-energy kids. 100% Guaranteed. 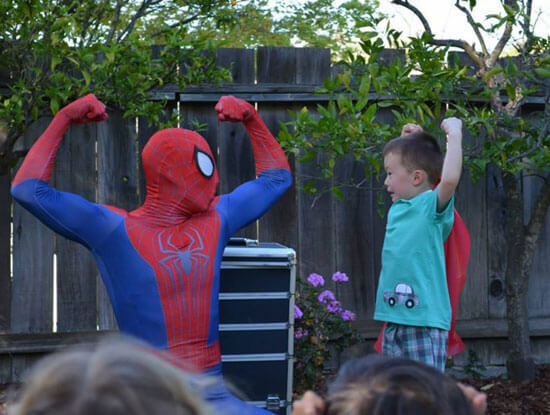 Andy Zandy delivers unforgettable professional entertainment for Bay Area parents who only want the best for their kid’s birthday party. 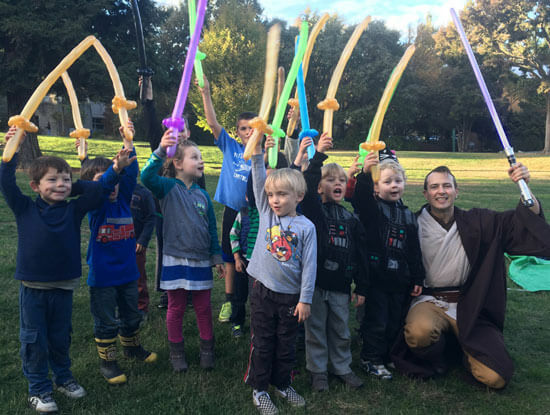 Andy’s high-energy shows and party themes engage your young guests with hilarious magic, action-packed physical activities, and balloon twisting, all the while highlighting your child and making them feel extra-special. 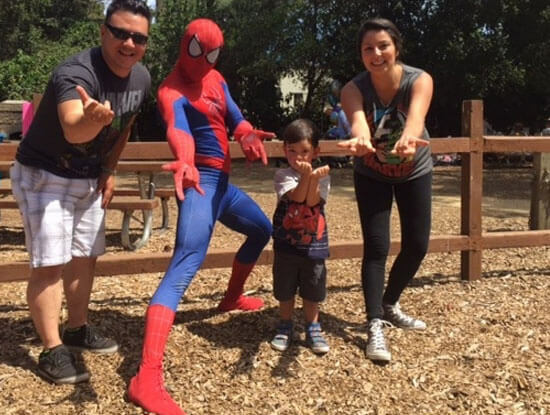 Bring Andy Zandy onto your team and secure your status as one of the coolest parents in the Bay Area! 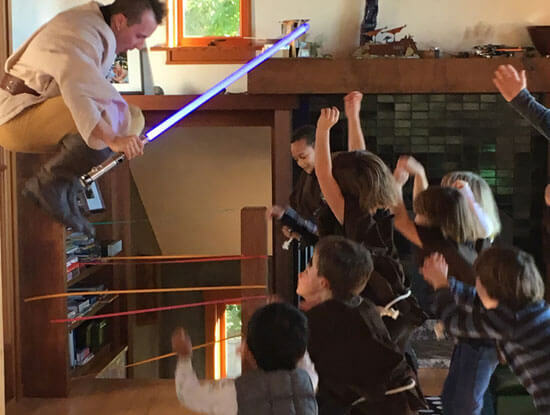 There’s no tedious organizing or coordinating needed; instead of running around trying to wrangle the kids at your party, you’ll be relaxing with the other parents while your little guests participate in an impressive, professionally produced birthday extravaganza. You’ll look like the best party planner in town! 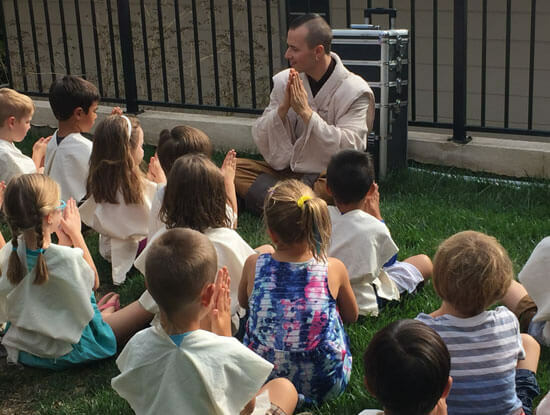 With 20 years of expertise entertaining family audiences, a BA in Drama, and advanced training in magic, physical comedy, and martial arts, Andy Zandy is the professional entertainer to call if you want to make your child’s birthday party a hit. 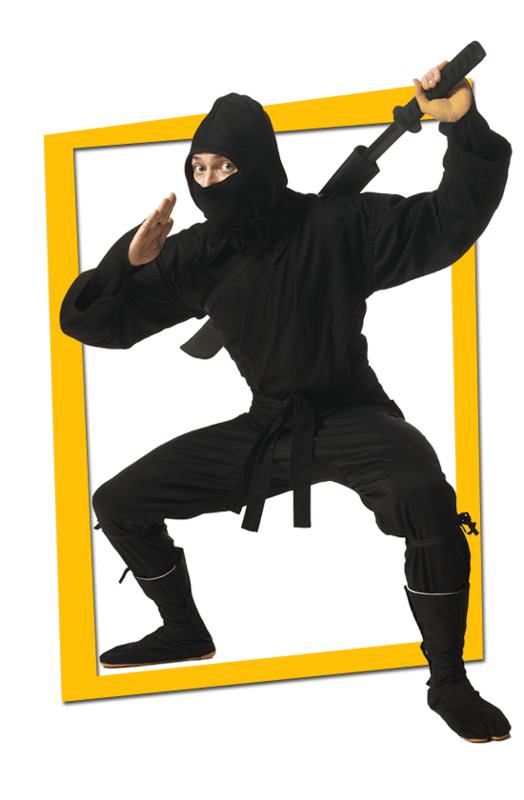 Andy offers five ultra-popular action party themes, including his out-of-this-galaxy Jedi Training party, his high-energy superhero birthday party, a stealthy ninja themed party, along with an enchanting children’s magic show and pirate themed birthday parties. All you have to do is get a cake and refreshments: Andy takes care of the rest! Find out why Andy Zandy has won both the Bay Area Parent ‘Family Favorite’ award and the Best of Gigmasters award for two consecutive years each. 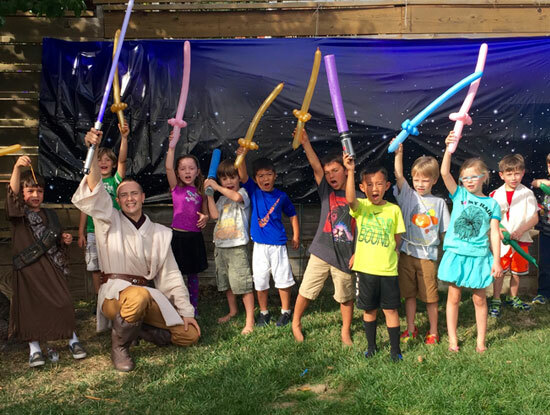 Hundreds of satisfied clients and an unbroken string of 5-star reviews agree: Andy’s high-energy action parties are the best way to upgrade your child’s birthday party to an action-packed event that your guests will talk about for months to come! 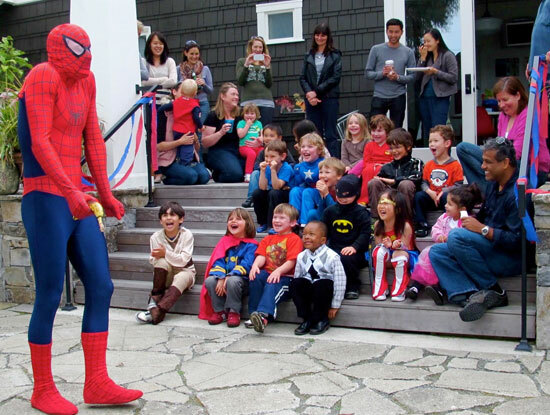 Planning a special party for your little one? 1. 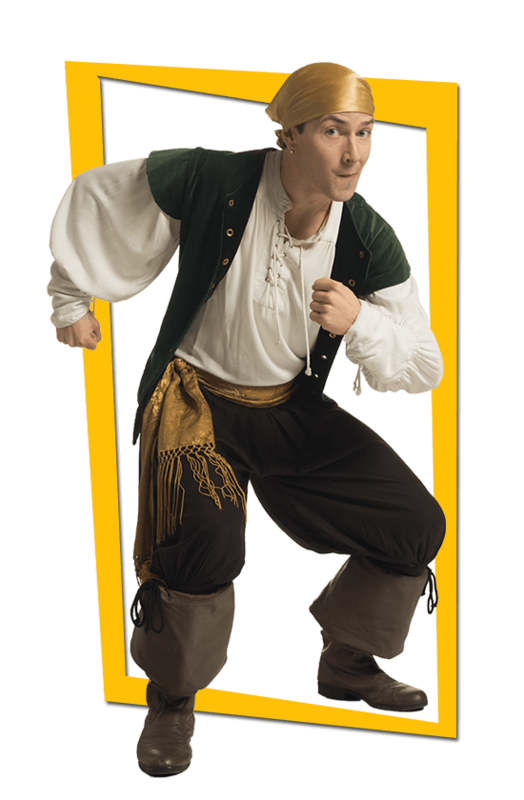 ENGAGING: Andy’s award-winning shows are full of fast-paced action that keeps your child and their friends fully engaged. This gives you a well-deserved opportunity to take a break, relax with the other parents, and enjoy watching your kids have the time of their lives. With Andy on your side, you’ll look like the best party planner in town! 2. PROFESSIONAL: After 20 years of entertaining family audiences, Andy’s level of client service is second to none. Andy is punctual, helpful, and friendly towards every single guest at your party. He shows up on time, returns calls promptly, and is always available for questions leading up to your event so you can feel 100% confident that your party will go off without a hitch. 3. 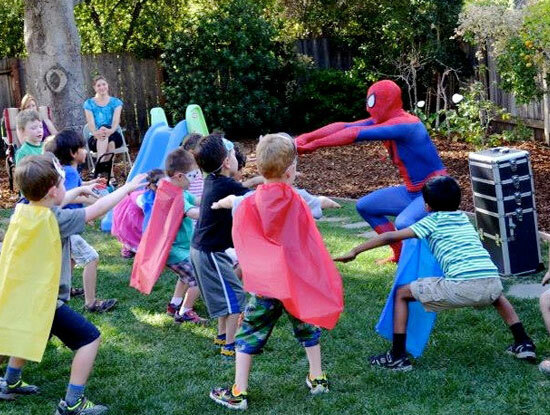 ACTION-PACKED: Kids can get pretty crazy at birthday parties if they don’t have a way to channel their excitement. To keep your party fun and orderly, every Andy Zandy party includes a physical movement component, giving your young guests a controlled, supervised outlet to burn off their excess energy. This makes the kids easier for you to manage when Andy hands them over to you at the end of his performance and makes your job as a host much easier. 4. SPECIAL BIRTHDAY ATTENTION: Andy always gives the birthday child lots of special attention and positive reinforcement during his show. This ensures that your child will feel a rewarding sense of accomplishment on their birthday while looking like a rock star in front of all their friends. To ensure smooth sailing, Andy can also give special attention to the birthday child’s siblings so that everyone feels included and part of the fun. 5. 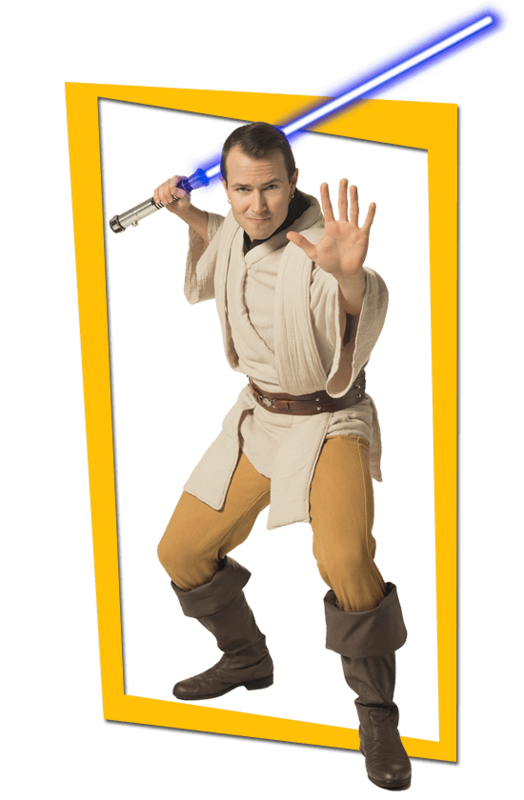 RELEVANT: Andy’s shows are themed and performed as characters that connect directly to the books, TV shows, and movies that kids love. 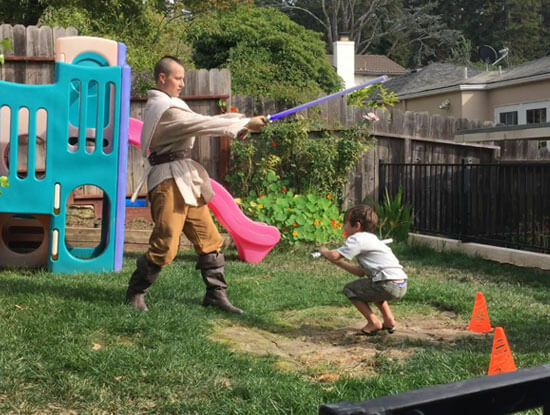 Andy is a huge fanboy himself and knows each of his characters and their worlds inside and out, which gives your child an opportunity to share their knowledge and enthusiasm with Andy in a satisfying, empowering way that no other Bay Area performer can match. 6. 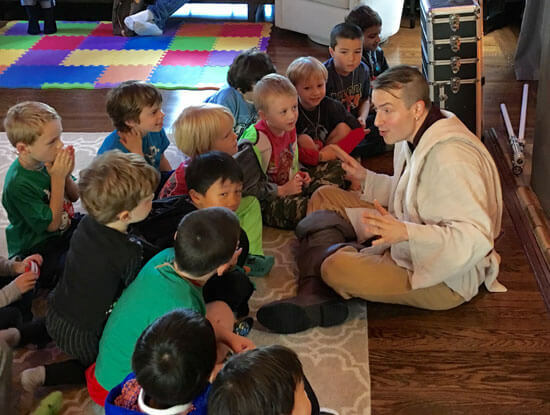 FUNNY: After 20 years as a professional entertainer, Andy is an expert at crafting clean, age-appropriate humor for children ages 3-8. Your child and their friends will be rolling on the floor with laughter at Andy’s jokes and physical comedy! Adults have a great time at Andy’s shows too! 7. 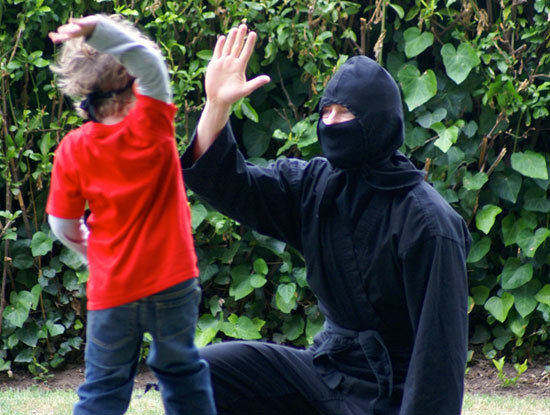 EDUCATIONAL: Andy’s shows aren’t just engaging and funny, they’re also experiential learning environments! 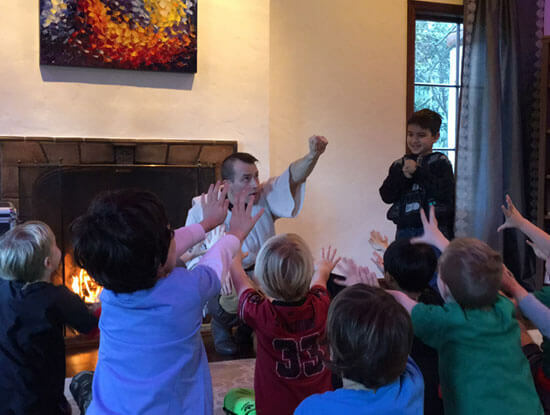 Whether teaching the basics of mindfulness, martial arts, or the pure joy of exercise, Andy connects important lessons to your child’s favorite interests, increasing their relevance in a way no classroom can. 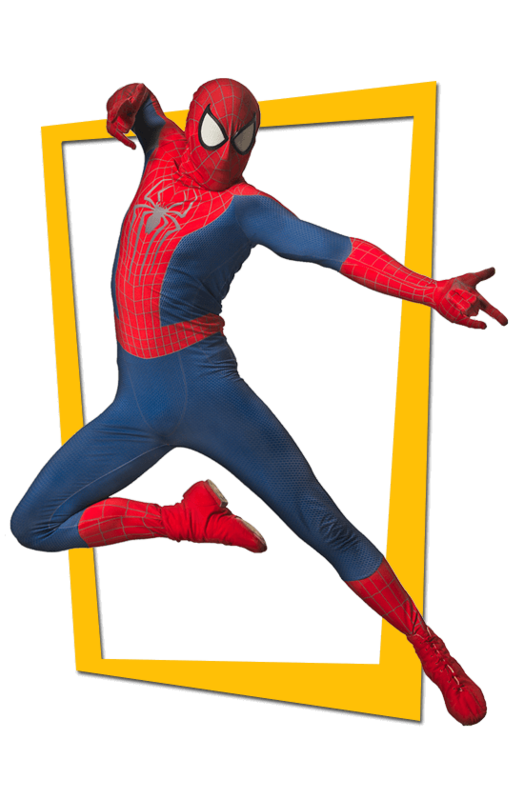 Consider this: Is your child more likely to work out because their gym teacher tells them to, or because it’s what Spider-Man does? 8. CLIENT FOCUSED: Every booking includes a free conference call with Andy, which gives you an opportunity to go over the unique details of your party. 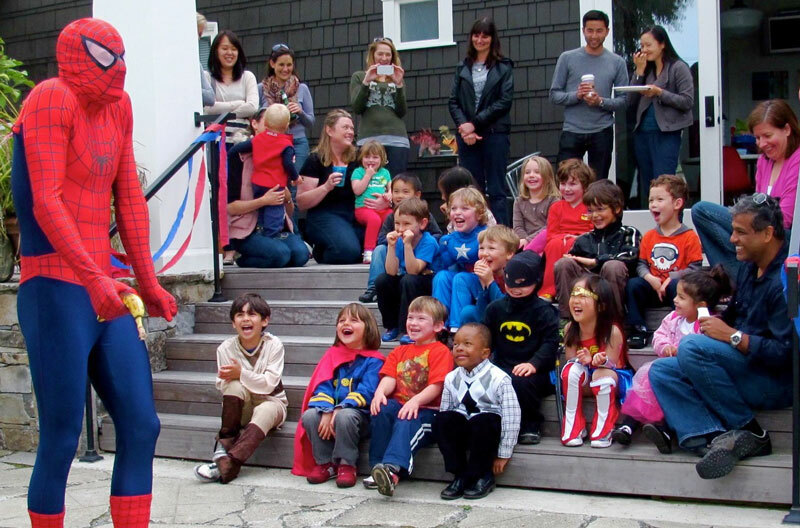 This also gives you an opportunity to ask any questions you might have and pick Andy’s brain about the finer points of throwing successful kid’s parties, which will help you avoid common mistakes and save yourself unnecessary hassle. 9. 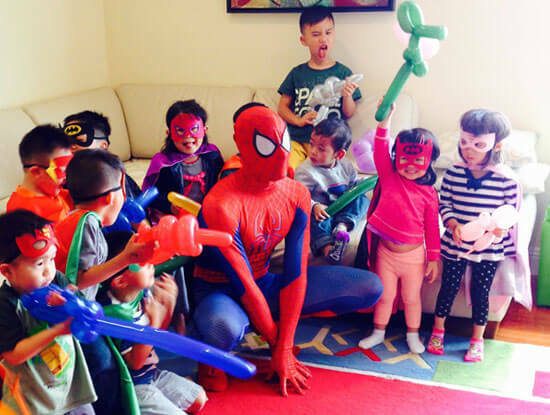 EASY: Andy’s parties are designed to be an all-in-one birthday solution for busy parents. 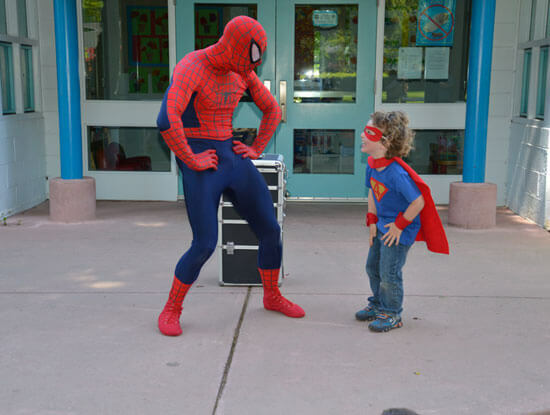 His show features your child and makes them feel special, gives all the kids fun activities to participate in, and leaves every guest with a custom balloon creation to take home as a party favor. All you have to do is clear a space for the show and buy cake and refreshments – Andy takes care of the rest! 10. EXPERIENCE: Andy entertains at over a hundred kid’s parties every year and has seen everything that can go right and wrong at such events. If unforeseen circumstances arise, Andy will be right there to help you keep things running smoothly so everyone has a great time. 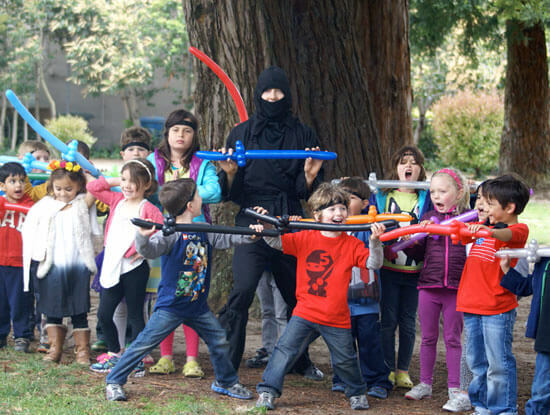 GIVE YOUR CHILD THE ACTION-PACKED BIRTHDAY OF A LIFETIME!